There is a waste crisis on our planet today, with plastic everywhere we look. And it is our responsibility, as individuals, to do something about it. 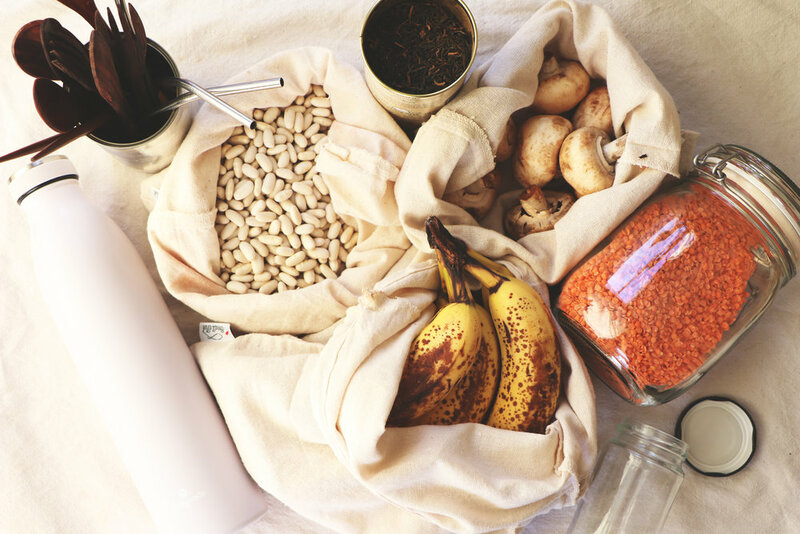 I have become increasingly aware of my own personal impact, especially since going vegan and embarking on minimalism, and found different ways to make small but significant changes to my lifestyle to reduce my waste. Having said that, I'm not perfect. And if you're looking to reduce your waste, try not to beat yourself up if you try and fail, over and over again. It's a battle against a system that doesn't seem to care at all about the waste we're producing or the impact we're having. Just do your best to reduce in the ways that make sense for your lifestyle. If we were all to do that, we'd make a considerable joint effort towards reducing our overall waste. That's why I wanted to put together 30 ways in which you can reduce your waste, very easily. There will be at least a few things on this list that you can change today to make a difference to your personal waste footprint. One of the biggest things you can do to reduce your waste, is to simply stop buying so much stuff. When you're buying new things, you're creating demand for that thing, as well as creating demand for its journey of production and the waste that comes along with it. Simply saying no to things you don't need, and being appreciative for what you already have is one of the biggest steps you can take to reducing your waste. Sadly most food these days is wrapped in plastic. The UK alone produces more than 170 tonnes of waste every year, much of which is food packaging. And if you were to look in your bin right now, I'm sure a lot, if not most, of it is plastic that was wrapping your food. For me, this is one of the biggest struggles I am working on in my day-to-day life, as supermarkets cover everything in plastic. You can't always win, but do your best to seek out foods that aren't wrapped in plastic. When you leave the house, make sure to bring your own bag. Plastic bags need to be a thing of the past, and instead we need to all be bringing our own reusable option. I have these really great cotton bags that are perfect for loose fruit and veg, and I usually am wearing a backpack with me when I'm out and about so I always have somewhere to put anything I am buying. But if worst comes to worst and you forget, just carry the items! Don't be embarrassed to say no to single use plastic, and use your arms instead. Not only is it better to support the local economy, but local markets and stores often use a lot less plastic to wrap their foods. So get organised, and try planning your weekly shop to visit the local farmer's market or green grocer's before heading to the supermarket. This is how we have been doing it for a while now, and it's a great way to find more zero waste options, get bargains on fruit and veg, as well as experiencing a sense of community from shopping locally. Look up online to see if there is anywhere locally that you can buy foods in bulk. Take your own containers, and stock up on the essentials without the extra packaging! Try avoiding items like plastic cutlery, straws, plates, cups and single use food items like pre-packaged salads, sandwiches, dressing, yoghurts etc. These things are easily replaced by reusable, or multi-purpose options, simply by staying prepared and saying no. Plastic bottles can take up to 450 years to break down, so its more important than ever that we stop buying plastic water bottles, and bring our own reusable versions. I have this amazing water bottle from Vanity Planet which I take with me everywhere. It's made from stainless steel, keeps the liquid inside cold or warm, and looks a whole lot cuter than a plastic bottle! I take my water bottle with me everywhere I go, and simply ask kindly at cafs or restaurants for them to refill it for me, or fill it up myself at a refill station. So if you're new to the low waste lifestyle, getting your own water bottle is great place to start. For 50% off, click here, and use the code "maddiespout" at checkout. When avoiding single use items, it's important to bring your own! I've had a set of stainless steel straws for years, and I use them out and about, as well as at home. I also picked up a super handy cutlery set before my travels (although I ended up losing the spoon, so replaced the cutlery with this set from Coconut Bowls). 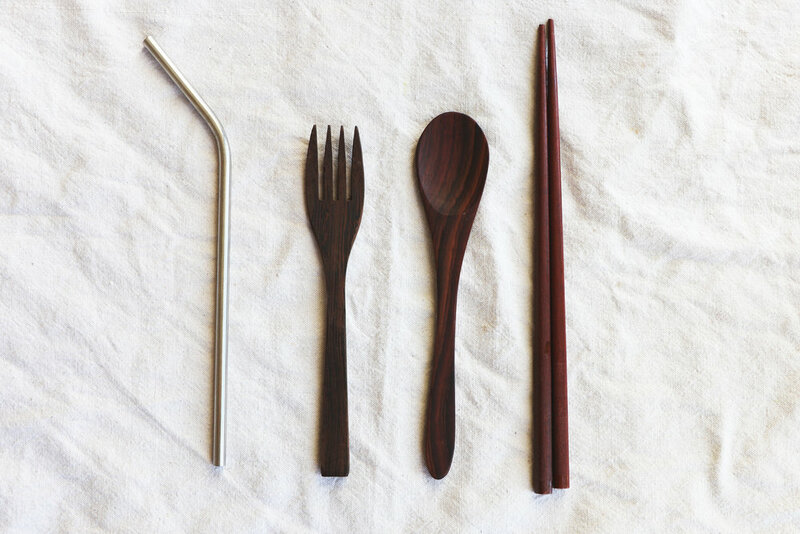 They're super easy to grab and throw in your bag when you're heading out, so you can avoid plastic spoons and forks. The same goes for containers. Grab whatever containers you already have, throw them in your bag when you know you're going to be eating food out that day that will potentially come in plastic packaging, and kindly ask for them to use your container instead. These simple swaps will very quickly make a huge impact on your overall waste production. It can be an easy one to forget, but try practicing saying no to straws when you order a drink. As adults, we really don't need to drink our drinks through straws. So bring your own or simply say no to avoid that extra plastic. I only recently made this switch, because I found out that teabags have plastic in them! I've been really enjoying drinking loose leaf tea from a teapot with an infuser, and if you drink a lot of tea like me, then that's saving a lot of waste. Buying secondhand clothes is always better than buying new, plus it saves you money. The fast fashion industry is one of the most destructive on our planet, and we're buying more clothing than ever before, with the world consuming over 80 billion pieces of clothing every year. So the solution is to ditch fast fashion and opt for secondhand instead. Next time you're after a new jumper, jacket or summer dress, visit your local thrift/charity shop, or look on secondhand apps such as Depop or eBay to see what gems they have (and grab yourself a bargain!). I recently got my new camera setup for a fraction of the price simply by buying it secondhand, saving around £500. So similarly to clothes, next time you're in need of a new electronic device, have a look around to see what you can buy secondhand. You'd be surprised how many people are selling electronics that are as good as new, for a fraction of the price. If you aren't composting, then most of the weight in your rubbish bin is likely coming from food scraps. Unfortunately, when food waste goes to landfill, it can't decay properly and therefore produces methane, a greenhouse gas. If you compost, you’re therefore reducing these emissions that are going into the environment. So if you have a garden, get composting, or if not, see what other solutions there are for you. Where we live, they don't collect food waste, so we rang the council to join a local composting scheme across the city's gardens. We simply collect our food scraps, and take it to the compost bins at our local garden to be composted. Approximately one third of all food produce in the world for human consumption every year (approx. 1.3 billion tonnes) gets lost or is wasted. In the UK alone we throw away 7 million tonnes of food every single year. The average household throws away £470 of food each year. These figures are staggering and put more emphasis on how much we need to be making sure our food isn't ending up in the bin. 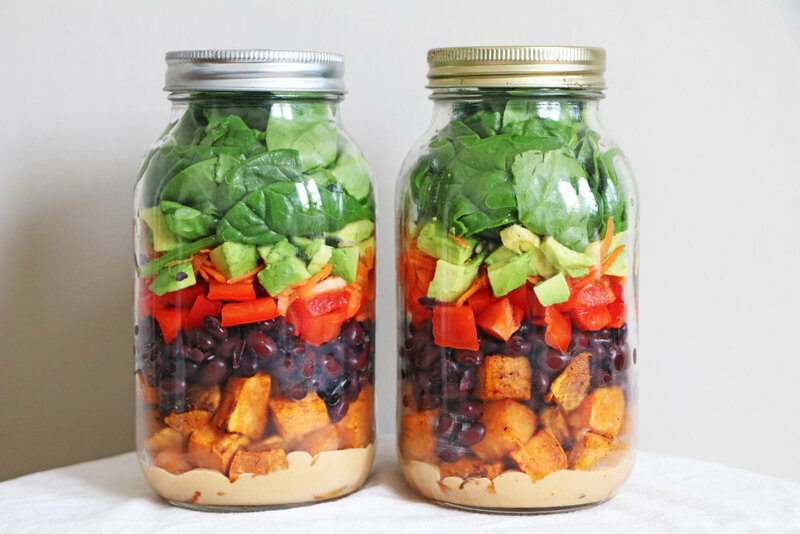 If you have leftover food, store it in a container to eat the next day; if food is about to go off, freeze it; meal plan your week; don't over-purchase on foods you won't eat, and become more prepared and organised when it comes to your food consumption. I often like to do a pantry or freezer challenge where I attempt to clear out either, and make meals with the foods that need to be used up. Food should never be ending up in our bins - and if it is, we need to sit back and think about why and find a solution for it next time. As aforementioned, meal planning can go a long way to reducing your food waste. Becoming organised with what you're going to eat during the week makes sure you're not over-purchasing on foods that you won't eat, or will go off, and end up in the bin. Simply spend 10-15 minutes each week sitting down to meal plan what you're going eat that week, and create a shopping list. You can even go one step further and meal prep your foods to ensure you don't buy plastic-packaged foods when you're out and about! Going vegan is one of the most incredible ways to reduce your impact on this earth. Compared to a meat-eater or vegetarian diet, a vegan diet's carbon footprint is dramatically lower. Animal agriculture requires massive amounts of land, water, food and energy, therefore making it a leading contributor to global greenhouse emissions (more than the entire transport sector). For example it takes more than 2400 gallons of water just to produce 1lb of meat, compared to 25 gallons of water to produce 1lb of wheat. Not to mention the impact of animal farming on the destruction of wildlife, overfishing, deforestation and the depletion of fresh water sources. Therefore, one of the most direct ways you can change your impact on the planet is by changing the food on your plate. I have lots of videos to help you learn how to cook your own delicious vegan food and to avoid getting takeaway. Cooking from scratch will enable you to avoid the plastic packaging that so often comes with takeaway food, get more bang for your buck, allow you to prepare food so that less goes to waste, and it’ll make your body feel better too! Use these silicone mats instead of single-use parchment paper or foil. I get asked a lot about them in my videos, and I use it all the time for cooking things in the oven! It can be tempting to jump on every new trend in fashion, gadgets or games etc. Whatever your weakness, think about whether this is a trend or something you actually want. Ask yourself if you will want this item a year from now - or will it likely be something that will pass as fast as the fad did? This may seem an obvious point, but there are many people out there still not recycling. Make sure you're recycling everything at home, including taking that extra effort to ensure items that aren't collected from your home are taken to recycle at your local dump. People with periods will use, on average, nearly 10,000 tampons during their lifetime. So this is one of the first areas we can look at if we’re menstruating each month. I have not looked back since switching to my moon cup, it is the best option I have personally used for my periods - they just take some getting used to. Not only are they better for the environment, but for me they’re a lot less hassle, as you typically only have to empty them twice a day, rather than having to change your tampon or sanitary towel every few hours. Alternatively look into options such as period underwear, or reusable cotton pads, to reduce the amount of sanitary products that are being thrown away. Get handy! Before you buy something new to replace that item that has broken, see if you can mend it. Sew up that hole, buy new screws for that gadget, paint that table. Do whatever you can do to fix it, and don’t get sucked into this throwaway culture. Building your own furniture sounds more complicated than it actually is. And often, you can make the most beautiful pieces of furniture from recycled materials. I made my desk from an old piece of wood that came from a wardrobe, along with some legs that I got on eBay. You can see how I did it in this video (it's very old, so be prepared to cringe). Get creative - see what old pieces of furniture you can find that can be transformed and upcycled into something useful and beautiful. It's surprising how long it takes to fully use things up. I have realised this since incorporating minimalism into my life, and watching how just using one moisturiser can last me around 6 months. So delve into your cupboards and see what you can use up, before replacing it out of habit. This could be done with toiletries, makeup, food in your pantry, whatever. This might seem disconnected from waste. But going on a budget can really help to reduce the amount we are consuming, and therefore wasting. So have a think about the things you want to be spending your money on, set yourself a budget and aim to stick to it. Setting up a structure to your finances will dramatically reduce mindless spending. If you have a garden or windowsill you can grow you own herbs or food in, give it a go! Things like herbs or potatoes are super easy to grow and saves you having to buy it from the supermarket in plastic packaging. Many areas will have a local veg box scheme where you can get a box of fresh, seasonal vegetables from a local farm, delivered to your door. I have an obsession with jars. Every time we buy something in a jar from the shops, I will wash it out, sterilise it and re-use it for something new. I love to use them mainly for storing foods in the cupboards, as well as in the fridge. But you can also use them to make your own candles; as a pen holder; for your own beauty products; to keep your hair ties and clips in; to drink from etc. The options are honestly endless! This may seem obvious, but it is alarming the amount of litter I see every day, in my local area and at my local beach. Make sure to always be careful about rubbish you’re using, and dispose of it properly. Your waste is your responsibility and nobody else's. Often at the end of the day, supermarkets will have reduced items that will end up in the bin if we don’t buy them. So when possible, try to do your next shop during the evening hours when the reduced items have been put out for sale. Very often there are things that were on your list anyway, or that you could use in your weekly meals. If you want to learn more about the plastic, waste and the environmental crisis currently happening, then please visit the links below. Knowledge is power!